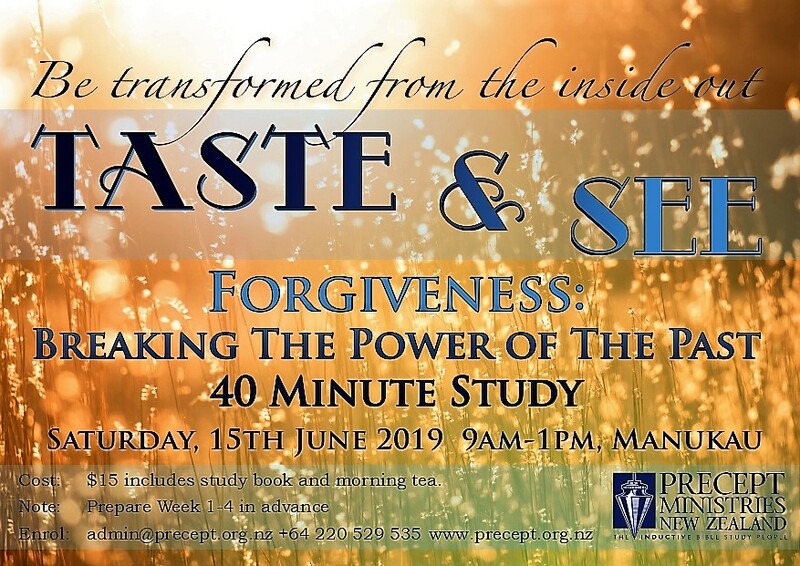 Order: your copy of "Forgiveness: Breaking the Power of the Past" in good time at admin@precept.org.nz for $15, includes P&P and morning tea. Book your seat by depositing $15 onto ASB 12-3040-0746599-00, add your name as a reference. Prepare: Week 1 - 4 beforehand. Place: at the MissioNZ Centre in Manukau, 20 Amersham Way, Manukau City (behind Westfield), in the Laidlaw Building. Free parking is betweeen the Laidlaw Building and the parking silo. Locked door: Should you be late, text or ring Barbara +64 220 529 535 so someone can let you in as the door will be locked all day. Bring coloured pencils, your study booklet and a jumper - it might be quite cold in the room due to the air con.